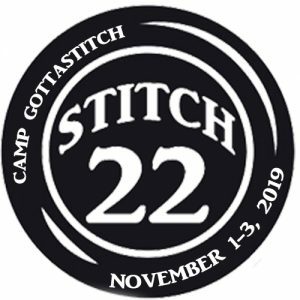 Registration is now open for Camp Gottastitch 2019 – Stitch 22! In our 22 years of hosting Camp Gottastitch, our attendance has fluctuated but we are excited that over the past 10 years, we have grown from a small gathering of 14 stitchers to last fall’s group of 58. Since we started visiting Amish country a decade ago, we increase to two weekends back to back, and then moved to the Berlin Grande as our need for space increased. Once again, we will be on the move for 2019. Our new location is the Encore Hotel, Berlin, Ohio, located just a few minutes southeast of the Berlin Grande and is next to Tis the Season (Christmas store), near the Plaid Sheep Company (quilt store and felted wool), and a few other shopping opportunities. Camp Gottastitch will start Friday night, November 1 and you will have the option of staying Friday and Saturday night or adding Sunday into the mix. If you wish to come a day early or stay later than those dates, you will need to make arrangements with the hotel itself. We are still waiting on a specific contact individual to make those additional arrangements, so please hold off until we let you know who exactly to speak with at the hotel. Camp Gottastitch is your time to relax and stitch with stitching friends. While we do give out kits through out the weekend, you may stitch on whatever you want. We have a fairly loose structure; the most important set-in-stone-ish time is dinner on Saturday night! You are free to stitch in the main stitching room, go shopping at local quilt shops, antique shops, and other local establishments. We will also have several trunk shows and a selection of stitchy stuff from Cross My Heart, Ltd to tempt you in our shopping boutique, Camp Gottashop. The Ohio Amish Country Quilt Shop Hop is October 31 – November 2, so you may want to come a few days early to get some additional Stash Enhancement Experience! Camp Gottastitch base camp rate includes all the stitching time you want in the main stitching room, prizes and give aways, Friday night and Saturday night lodging, heavy appetizers on Friday night and Saturday dinner. The hotel provides breakfast. You may add on Sunday night for an additional cost (see below) which will include your lodging and Sunday lunch and dinner. We have several configurations of rooms available. Please make sure you answer ALL the questions on your registration form so that we can place you appropriately. We do fill up quickly and we are tentatively capping our group at 65. While we want to accommodate as many stitchers as possible, we also do not want to make Camp so big that you do not have a chance to mingle with everyone there. Thank you for your continued support and look forward to seeing you again at Camp Gottastitch! Please return to this page after filling out registration form if you are paying your deposit via PayPal. You may also use your credit card if you do not have a PayPal account using the button below. A new tab will open in your browser and you will need check out from that page. If a new window does not open, please turn off pop up blockers for PayPal. There are several options to select when paying via this form; however, if you need another payment option (i.e. a different payment amount that what is available in the drop down box) you may call the shop with your credit card number or you may email us for an invoice.